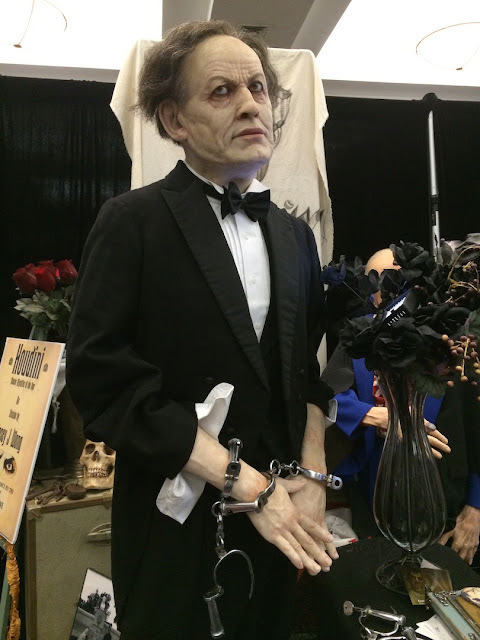 Special FX Makeup artist Casey J. Wong has created an incredible life-size figure of Houdini which he is displaying this weekend at Son of Monsterpalooza, a convention of monster makeups and memorabilia held twice yearly in Burbank, California. Casey's Houdini stands 5ft 5in and is made of silicon with yak hair individually placed strand by strand. 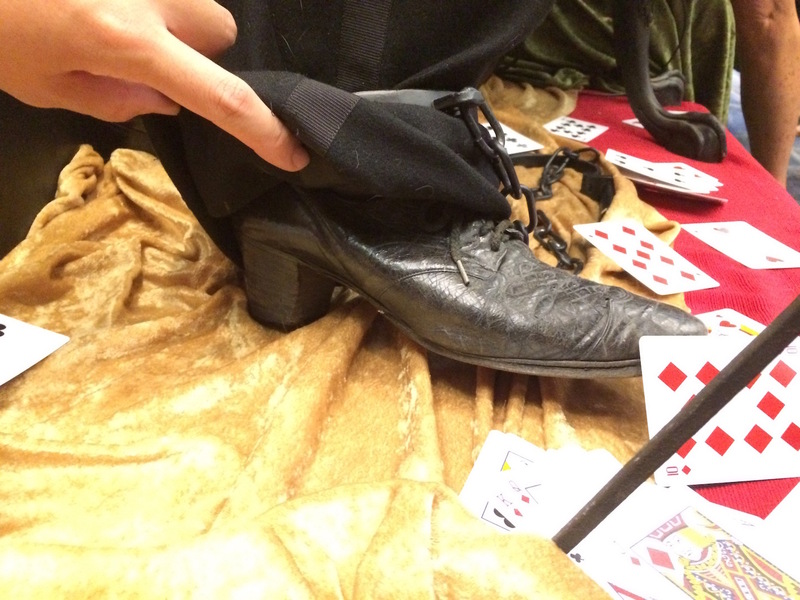 He is dressed in a vintage 1910 tuxedo and shoes from the same year. 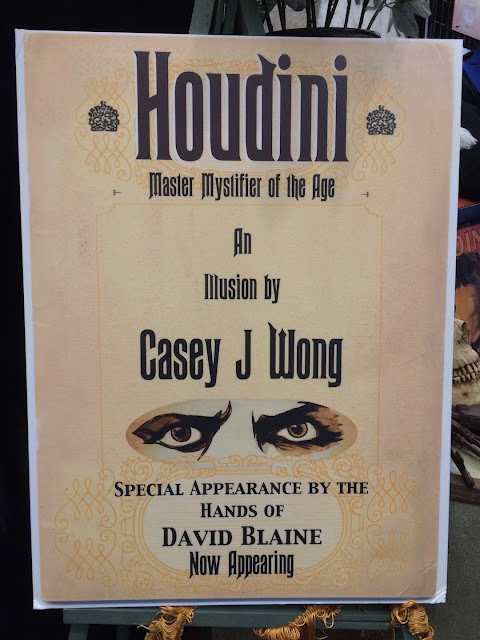 Casey says his Houdini is meant to depict the great magician near the end of his life, a time the artist feels Houdini's face showed all the character from a full career. One very unique feature is that Houdini's hands are actually modeled from the hands of magician David Blaine. 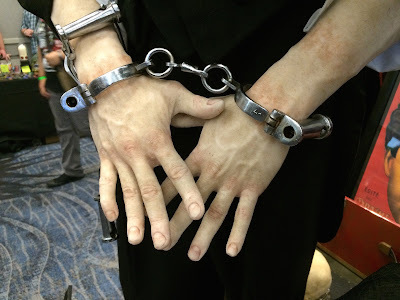 Below are more photos and a brief interview with Casey Wong who describes the secrets of his Houdini. 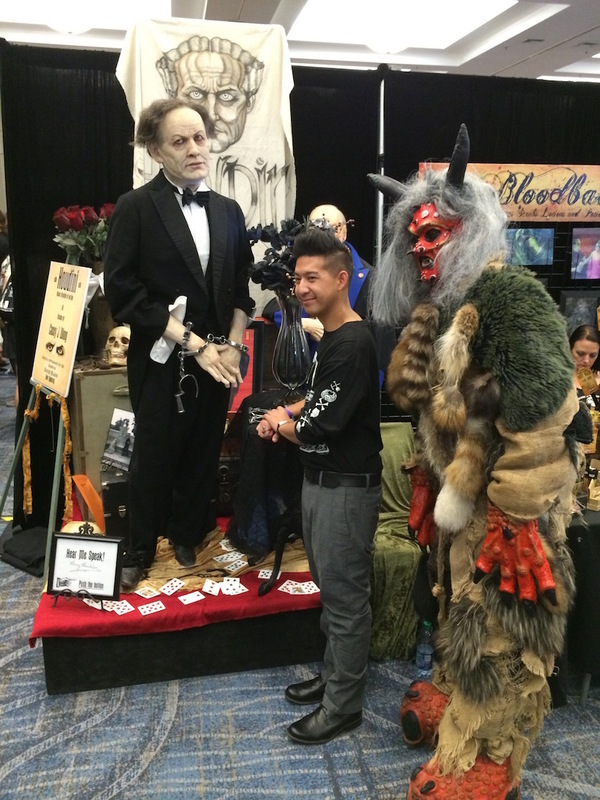 The good news is you still have a chance to see Casey Wong's incredible Houdini figure because Son of Monsterpalooza runs one more day tomorrow, Sunday, September 20 from 11:00 AM to 6:00 PM at Marriott Burbank Airport Hotel located at 2500 North Hollywood Way, Burbank, CA 91505. 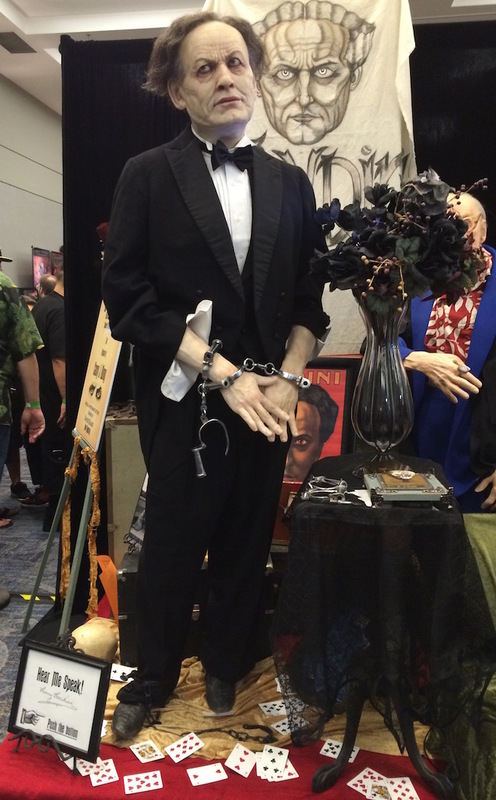 Casey says he is not yet sure what he will do with his Houdini likeness when the show is over. 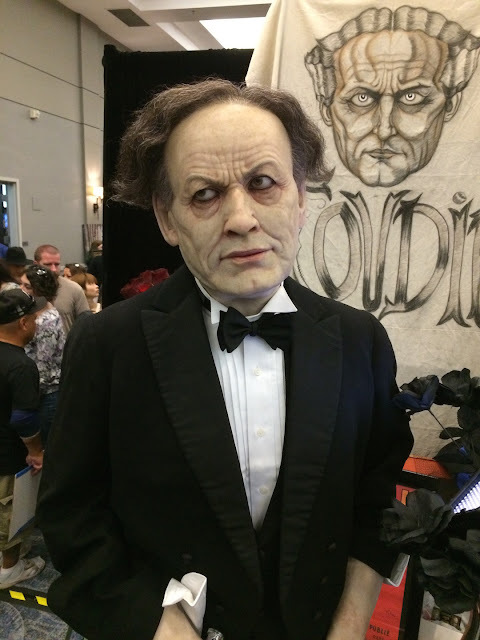 Let's hope it doesn't vanish, because this is really something that should be seen and enjoyed by all fans of magic and special effects makeup. You can see more of Casey Wong's work on his Facebook page. A monstrously big thanks to John Cannon of Aladdin Books and Joe Fox for the alert. Nice but almost looks like a zombie Houdini. Best to smooth out a few of those facial wrinkles. There is a resemblance but I also agree that it's a macabre version of HH. The nose is a bit too wide: HH had an aquiline nose. Mr. Wong should apprentice at Madam Tussaud's, he definitely has an affinity for this type of art. I would almost like to see this figure on the floor, rather than on a platform, to show his height. I'm amazed at how large a figure Houdini was, despite his lack of stature. Yeah, I would have liked that as well. Napoleon was also a large figure with a short stature. A nice touch would have been the use of vintage playing cards. The cards I see strewn on the floor of the platform look modern. The figure is not so much handsome as ghoulish. Even if Harry had lived into old age, I doubt he would have looked this haggard. Slightly off topic, but how did the song "Rosie, Sweet Rosabel" become known as Harry and Bessie's favorite song? The only reference I've found Is from the newspaper report of the Arthur Ford "séances", where Bess supposedly took off her ring and began singing, though according to John Hinson that story was a myth. Supposedly after Bess took off her ring and started singing, Houdini [via Fletcher] said “Thank you, darling, the first time I heard you sing that was in our first show together years ago.” Mrs. Houdini, it is said, nodded and wiped a tear from her eye. That said, it was a popular song of the time and it may have been part of the Floral Sisters Act. Nicely done but agreed the face should have been smoothed out and those eyes need more intensity. Looks like he's spent too many days in the WTC. This figure doesn't look an ounce like Houdini. It's just scary!